When you’re drowning in credit card debt, a 0% balance transfer can feel like a lifeline. And sometimes it is. But there are also lots of people who find themselves even deeper in debt and stress as a result. Let’s talk about why a balance transfer might not be the cure-all you’re hoping for. A balance transfer involves moving the balance of an existing card to a new one. To encourage card holders to make the move, banks often sweeten the deal with special offers, usually six to 12 months at 0% per annum. The benefit to the consumer is that their repayments directly reduce the principal which allows the debt to be paid off sooner. So where can things go wrong? Depending on the amount you transfer, it's unlikely that the minimum monthly payment will result in the balance being fully paid off by the end of the introductory period. When the discount period expires, any remaining balance will revert to the card’s normal interest rate, usually around 20% per annum. The introductory rate usually only applies to the balance transfer. Any new purchases on the card will attract interest at the card’s normal rate—again, usually around 20% per annum. What’s more, the card issuer may decide to apply your monthly repayments to your balance transfer first while your new purchases continue to accrue interest month-on-month. Make sure you read the fine print. Balance transfers usually come with strict rules—break them and the honeymoon is over. To adhere with the requirements, you’re probably going to have to pay on time and always meet the minimum repayments. There are also fees and charges associated with balance transfers. 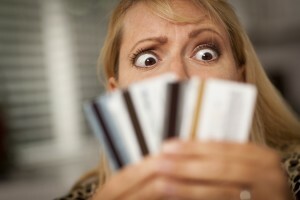 Some card providers charge a flat rate while others charge a percent of the balance. In a perfect world, you would cut up your old card as soon as the balance is transferred to your new one. Unfortunately, many people keep using their old cards—as well as their new ones—and end up with twice as much debt as they started with. The biggest danger of using credit to pay off credit is that the underlying causes of your money problems are still there. A balance transfer may buy you time, but it’s no substitute for truly taking control of your money. The only way to do that is through budgeting.